10g of Linette® represents more than half of your daily recoomended amount of omega-3. A blend of extruded Linseed seed 'Tradilin' ® (50%) and Wheat Flour (49.8%), Antioxidant: Natural Rosemary Extract (0.2%). 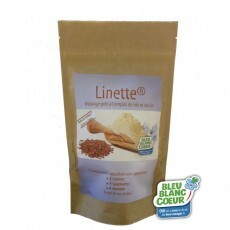 Linette®, is ready to use linseed ! A subtle blend of wheat flour and linseed cooked and finely round, following a process that allows you to benefit from the nutritional properties of linseed; fibre, lingans and especially, Omega-3 !